Late in the 19th century, a group of hunters sought to breed one of the most versatile hunting dogs in existence. They didn’t want a hunting dog that specified with one type of game, but one that could hunt all game on all different terrains. They started first with the Foxhound, then implemented the Pointer and Poodle somewhere along the way (the records are a bit vague here). 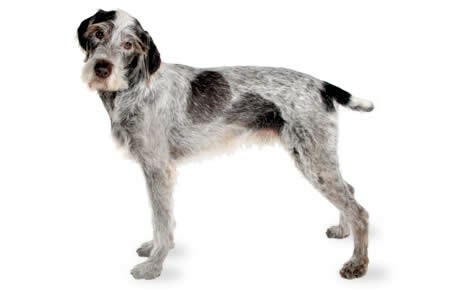 What we know is that somewhere along the way the German Shorthaired Pointer, and the German Wirehaired Pointer were bred. These two were differentiated by coat length and then size in general (the German Wirehaired Pointer is slightly larger). With extreme success as a hunting companion, the dog was then imported to the US in the early 20th century, but almost immediately lost popularity due to its heritage (the Germans were hated severely in the era of both world wars). However, about a decade after WWII, their popularity rose once again in the states, and by 1959 the AKC included them and added ‘German’ in front of their name once again. This breed is a hunting dog through and through. Within the home, the German Wirehaired Pointer personality is overly affectionate, loving, and even quirky, but with others he’s often aloof. They’ll often choose a favorite—even within the family—and go out of their way to seek their attention. In the past, this breed was nearly as guarded as the German Shepherds (this is to say those bred in Germany are more staunch to their tradition), but over time they’ve become more of a home dog. Aside from being loving within the family, they’re also great watchdogs. They absolutely adore having a job (often needing one) and if that’s protecting the family or barking at strangers, the German Wirehaired Pointer won’t hesitate to do so. They can be aggressive—especially if not properly raised—and tend to show that if they feel their loved ones are in danger. Let’s not forget intelligence, as this dog has serious brains. Almost too much, as they can often be intelligent to the point of independence, and that usually tracks along stubbornness (especially in the face of training). If not given enough attention or stimulation, this breed suffers from separation anxiety and restlessness. Just by the name, you should know that this is a dynamic canine, and needs to be treated as such. However, by in large, they’re friendly, docile, a great companion in and out of the house, wary of strangers, and protectors of their loved ones. Let’s iron something out here: this dog was bred to be a dominant and dynamic physical power, intelligent enough to learn the full range of ‘the hunt,’ and to have the stamina to endure. The German Wirehaired Pointer has lots of energy, thrives when he has a job to do, and is constantly starving for stimulation. Since this is a hunting dog, often they’ll receive specialized training (being that they’re pointers), but that aside they benefit greatly from puppy classes. Obedience training will help them learn to respect authority (and give them the intellectual stimulation they crave), and then at home, it’s your job as the owner to keep a firm and constant hand, as this breed will challenge you whenever they can (especially if they’re not out running through fields). They respond decently to positive reinforcement but need to identify you as the alpha. Make sure, especially in their formative years, that they’re receiving the proper exercise as when they’re tired, they’re prone to be docile. Early socialization is a must with this breed, particularly to curb that aloofness that can come naturally to them. The more comfortable they are in social situations, the more prone they are to being a bit more outgoing and affable. Introduce them to people, other canines, environments, and social settings early on to ensure a better temperament and higher trainability in the future. Last point: these dogs can really jump. Make sure your fence is over 6 feet (and sometimes higher) if you’re going to let them run freely in the yard. They have a pension for the outdoors, a strong prey-drive, and the intelligence to escape. These dogs were born to run. Sounds corny, we know, but it’s true. Being that they’re a Pointer, hunters rely on their stamina to last for the entire hunt, and it does (if they’re trained properly). Point is: they need lots of exercise. In their puppy years that enthusiasm will be cute and contagious, but be wary that it doesn’t exactly wane with this breed. They’re consistently ready to be active. Being that they’re intelligent—and love a job to do—it’s beneficial to blend exercise and training into one, so to stimulate them in two ways. When training them, teach them tricks, play games (like hide and seek), and challenge them. In terms of sheer athleticism, these dogs are fantastic companions. They can run for hours, swim, navigate difficult terrain, hike, and keep up on most adventures. It’s recommended that the German Wirehaired Pointer exercises for 45 minutes a day (more if needed). They benefit greatly from having a yard to roam around in, and often need a lot more exercise if they’re going to be an apartment dog. This is one of those breeds that requires a lot of the owner’s time because of how much stimulation it takes to tire them, and maintain a healthy temperament. A German Wirehaired Pointer typically lives anywhere from 12-14 years. Are German Wirehaired Pointers a Popular Breed? The German Wirehaired Pointer ranks 64th on the AKC’s most popular list of 155 dog breeds. Due to that ranking, they’re often pure, and closer to their heritage than more popular dogs. However, these little handfuls can be quite demanding when it comes to time and attention and aren’t a good fit for the first time dog owner or the one which doesn’t have a schedule which permits them to give their dog the attention required. Despite, these hunting dogs are fantastic—hunting dogs obviously—companions and home pets. They’re tolerant of children and will often be extremely loyal to them, particularly if the youngsters and the dog are introduced early on. They’re steadfast in their intelligence, well-tempered watch-dogs, and a capable adventure buddy. The recommended daily amount to feed a German Wirehaired Pointer is around 3 cups of high-quality dry food per day. It’s important that—with the athleticism of this breed—they’re given a healthy and nutrient-heavy diet from the get-go. They’re not glutinous about their food, and their activity level often calls for more than the required amount. This breed sports a double coat that serves as a blanket for cold and rainy weather, as well as a shield for thick underbrush and shrubbery. The coat is wiry (as you could’ve guessed) and coarse to the touch, often falling flat which gives the dog a sort of matted look. Often, the undercoat is thick and regulates heat in the winter, but sheds and thins in the summer. They come in different shades of white, liver, scab red, and even golden at times. Sometimes the canine is solid colored and other times there is—quite apparent—spotting. Despite the aesthetic and structure of their coats, they’re easy to maintain, often only requiring a weekly brushing to mitigate any shedding. Bathe them as it comes, but you’ll probably find that your German Wirehair loves playing in filth, and will need to be bathed regularly. If so, be sure the products you use don’t deter their coat’s natural oils. Trim their nails monthly—although you might not have to as their rigorous activities will often wear them down naturally. Brush their teeth two-three times a week to avoid tartar or bacteria buildups. Check their ears, eyes, mouth, nose, paws, and bodies for anything suspicious. Look for parasites, inflammation, redness, infection (often given away by odor), and rashes. These dogs love to get down and dirty, and will often harbor gunk in their wiry coats. Be aware of this. Are German Wirehaired Pointers Good with Children? How well a German Wirehaired Pointer does with children greatly depends on their upbringing. This breed can certainly be a one-person canine, but if raised alongside children, they’ll become a family dog. At that, they’re fantastic with children. The German Wirehaired Pointer characteristics are loving, gentle, and playful – these dogs grow to become the child’s best friend and companion. Their prey drive may take a bit to curb, but generally they’re well-tempered. Another positive attribute is they’re not big enough to really cause accidents, and not small enough to be considered fragile. A German Wirehair that is indeed a one-person dog, which has not socialized with children, should be supervised if they’re exposed to youngsters. In this case, they can often not understand the child who is seemingly without consequence and can react poorly to rough play. Hip Dysplasia: this occurs when there’s displacement between the hip joint and femur. Symptoms include an abnormal gait, pain when walking, lameness in the leg(s), and at worst immobility. This is the most common joint-related condition that affects athletic (and usually bigger) canines. It’s never life-threatening and varies in severity. However, it can be screened for and dogs that have it should not be bred, which only stresses the importance on those health clearances. There are treatments available for this particular condition, and surgery if it’s bad enough. Cataracts: this occurs when there’s an opacity in the lens of the eye and has different degrees of severity. It ranges from being nothing but a cloudy film that changes the eye’s aesthetic, to complete blindness due to the opacity tearing the lens. The good news about this particular condition is that often the opacity can be removed via surgery and that these surgeries are generally successful. Cataracts are never life-threatening. Von Willebrand’s Disease: this condition affects the dog’s blood, debilitating the clotting process. Symptoms usually take the form of excessive bleeding. After an injury, it will be hard for the bleeding to stop, and it can even seep out of the gums and nose (we know, quite horrific).